shared Meena, a kitchen gardener from the Prem Nagar village in Badin. Meena was selected as a participant for a series of Kitchen Gardening trainings in 2016 under the three-year, Promoting Food Security and Sustainable Agriculture projectⁱ. One of the key components of the ongoing project focuses on promoting kitchen gardening among local women in Badin through conducting skill-building trainings on produce gardening, providing informative sessions on family and individual nutrition, arranging exposure visits to relevant institution and running awareness campaigns with the local communities. All of these activities are done to ensure the growth of kitchen gardening practices among households in Badin to reduce food insecurity and to improve the health and livelihoods of local agrarian communities. As one of the participants of this component of the project, fifty-five-year-old Meena learnt effective and new techniques of plowing, preparing and watering her land and fertilizing the seeds that her family was provided under the project. After building on her gardening skills, Meena primed a patch of land outside her house in accordance to the new practices she learnt in the training and planted the seeds she received meticulously. Meena’s garden has been one of the most flourishing ones, with a variety of fresh fruits and vegetables produced regularly. Her lush green garden produces cluster beans, apple gourds, ladyfingers, ridge gourds, spinach, carrots, radish and tomatoes. Living with her husband and three married sons, Meena shared that her garden yields have made a huge impact on the health and nutrition of all their family members. The quantity and quality of food cooked at home has improved immensely. My family loves the meals we cook at home now. My kitchen garden has allowed us to save the money that we previously spent on purchasing vegetables and fruits from the local market. In addition to fully providing for the nutritional needs of my family, selling of the surplus produce of my garden has helped me in generating a revenue of PKR 32,270 (Approx. USD 262). Meena and her family were provided with additional fruit saplings of guava, sapota, mango, black plum, lemon, jujube, neem, moringa, phalsa and conocapus under the project in August this year. Badin district is situated at the tail end of the canal irrigation system. With limited rainfall and no stored water, the area faces severe water scarcity. Each year the produce of large acreages of agriculture land is further reduced. The undersized production of my kitchen garden forced me to explore ideas for water storage. My husband and I decided to invest the money I earnt through selling the vegetables in constructing a small water pit, which will help us store water. So, we have now constructed a water pit with a water pump beside it to pump the water out of it. The savings have helped us take quick decisions such as this to help us sustain our garden and our household. 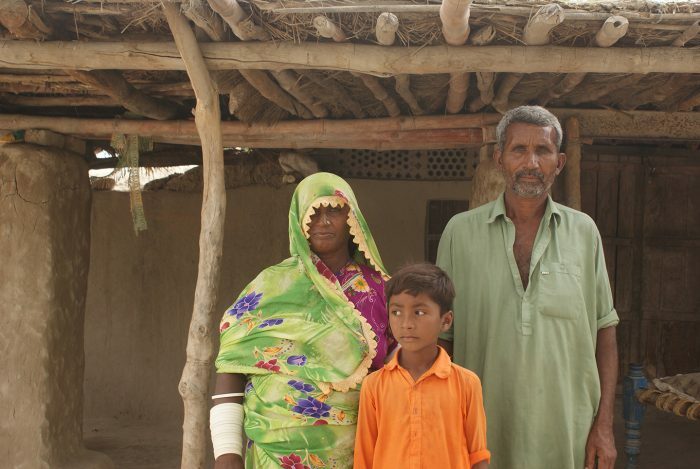 ⁱPromoting Sustainable Agriculture Practices to improve Food security and Livelihoods of Vulnerable and Marginalized Farmers project in Badin is supported by the Canadian Foodgrains Bank through Presbyterian World Service & Development.